Basic Supersuit UV's for the Supersuit product have been fixed! Our voices have been heard. I changed the Basic Suit's surface groups to match up with the Supersuit as much as possible (basically the major groups match pretty well, all the tiny seam surfaces are not present ). The new version you sent me works without the issue. It could be because I can now apply the material directly where before I was copying and pasting random surfaces from shader mixer. Thanks! OK, so if you guys like the direction we are going with these changes, then I am going to move forward on this and get it ready for QA. Very, very impressive. REALY looking forward to the update. Thanks for all of your efforts, it certainly looks worthwhile. Ok, I tested several Supersuit presets. They don't transfer perfectly as you can plainly see in pics 1 and 2. Not sure if what circled in red is supposed to do that or not. Other than that, it works perfectly. I then created my own texture for the Basic Suit just to see how well the UV map worked out for that. Works perfect! Except for a problem area I circled. Not sure what's causing that, but when I zoom in, it disappears. Only appears in distant shots, which is weird. Could be the simple Displacement map I'm using in that render. Hello? DAZ Jared? Josh? This in Q&A? 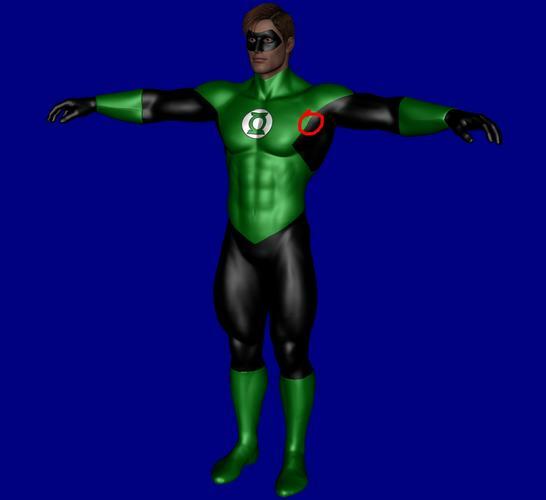 Resolved Issues: 2013-08-26 - Updated Basic Suit materials and UVs to take Supersuit texture maps, updated Metadata. I’m guessing this is the issue people have been talking about? Not sure, since I haven't used the basic suit. Has anyone tried the new download for the Basic Supersuit yet? Mine doesn't seem to have changed at all. The torso front is still on top of the back piece!! Neat. I'll have to try it. The reason you see this is because the mesh for the SuperSuit and the Basic suit are different. The SuperSuit has a higher resolution. 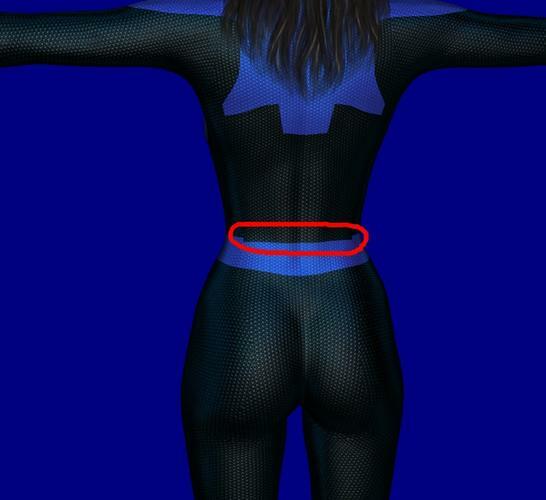 When the mapping was originally done for the Basic suit the seams lined up with the seams for the SuperSuit. The problem existed with the material groups, and what was grouped where. When I went through and re-did the groups I tried to get them to match as closely to their Supersuit counter part as possible. Unfortunately there were areas where the meshes didn't line up very well, and I had to make a decision as to where which surface the polygons were going to be placed in. I made the decision based on what I thought looked best. Obviously it isn't perfect though, that is just due to the differences in the meshes. I sorted out the problem of still having the wrong UV, but I have changed the UV back to the original with my UV Fix, as I do NOT want a duplicate supersuit on the Basic suit. I have several textures I have made which no longer work with the new one. Mine are shorts, trousers, shirts etc. If I wanted fancy supersuit ones I would use the Supersuit!!! Strange, I stopped receiving notifications when you guys reply. Wilmap, did you say you created your own UV maps that work correctly, or are you just using the old broken ones?